What Did Those Handbooks Say, Anyway? 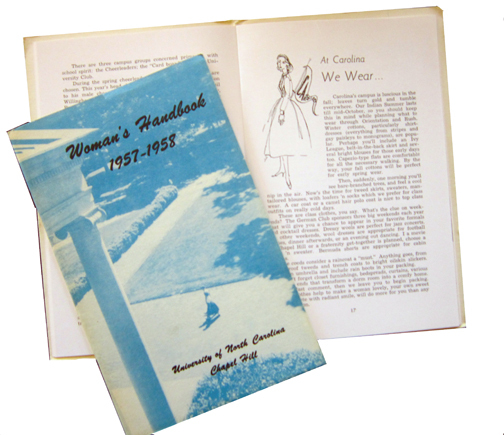 Through the mid-1950s, the Carolina general student handbook was a man’s world — there was barely a mention of women in the days before they were fully integrated into the student body (except a list of places to take them on dates, and where their dorms were located), although female students had been on the campus since 1897. Following is some of what awaited the Carolina woman at orientation, and stayed with her until graduation … or suspension. 1947 Any girl leaving a dance intent on coming back to it has to have a chaperone with her while she’s gone. 1948 “Closing hours,” in other words curfews: 11 p.m. Monday-Thursday; 1 a.m. Friday and Saturday, midnight Sunday. These were in place, with some modifications for upperclassmen and those with special parental permission, well into the 1960s. All undergraduate women must live in a dorm or sorority house. Exception can be made only by Dean of Women Katherine Carmichael. It is she who makes dorm room assignments. On the closing hours: “If late, a girl is to report herself to the house president. She will be brought before the House Council and punished accordingly.” Examples: One night’s probation (8 p.m. to 5 a.m. house arrest) for the first 10 minutes late, and another for each 10 minutes after. No baths or showers after 11:30 any night. Lights out at 11:30 Monday-Thursday. Two girls can’t sleep in the same bed. To spend night out, the hostess must get the house mother to invite. No going in men’s rooms. You can go to a fraternity house only with strict obedience to the Interfraternity Agreement drawn up each fall. Carmichael can throw a blanket ban on a house that hasn’t lived up to the agreement. Interestingly, no dress code is mentioned at this point. But includes dress suggestions, and pants are not mentioned. All that, while harsh, is understandable. This, on the other hand: “If a girl receives a telephone call, it is up to her to see that the next ring is answered. Failure to comply will be penalized.” This pertaining to common hall phones, and somewhat pre-personalized ring tones, one wonders, how did the girl know it was for her? 1954 A woman can visit a man’s apartment only if a minimum three couples are present. If kicked out of school you’ve got 48 hours to be gone. 1956 First inclusion of Katherine Carmichael with UNC’s top administrators, 10 years after she became dean of women. 1961 There seems to be a little letup on visiting social rooms in men’s dorms. The term “a campus” is in now — enough violations and you get “a campus,” a night of house arrest. There’s a photo of a male and a female student sitting on a bed studying. This is puzzling, given that open visitation still is being debated. “Self-limiting” hours are now in effect for juniors and seniors not currently under disciplinary penalty. You still must sign out and in if you don’t have a parental waiver. For freshmen and those without self-limiting hours, curfew is midnight Sunday-Thursday, 1 a.m. Friday and Saturday. You have to live in a dorm or sorority house unless you’re 21 and have parental permission. Men are allowed in women’s social rooms after 8 a.m.
You still must sign out and in for weekends away, and have parental permission. No dress code is mentioned.